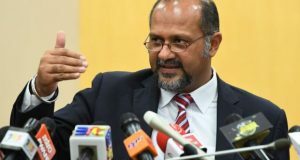 Telekom Malaysia is notifying customers of Packet One Networks (P1) that it will be shutting down the WiMAX network soon, to make way for Unifi Mobile. Thank you for your continuous support in using our WiMAX services. However, we wish to inform you that our WiMAX services will be discontinued in your area soon. This is to make way for our LTE network infrastructure deployment, in our aspiration to create a better experience for our members. We hope by giving this advanced notice would help you make the necessary arrangements to avoid any disturbance to your daily routine. 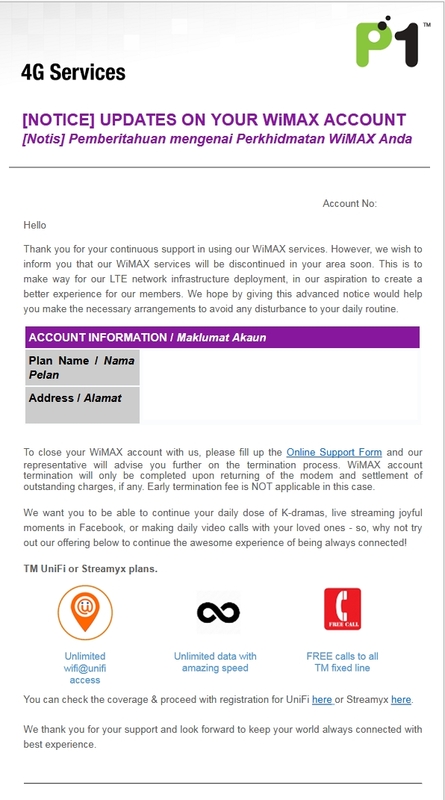 To close your WiMAX account with us, please fill up the Online Support Form and our representative will advise you further on the termination process. 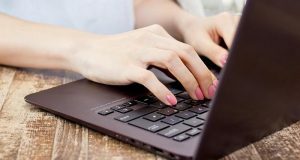 WiMAX account termination will only be completed upon returning of the modem and settlement of outstanding charges, if any. Early termination fee is NOT applicable in this case. We want you to be able to continue your daily dose of K-dramas, live streaming joyful moments in Facebook, or making daily video calls with your loved ones – so, why not try out our offering below to continue the awesome experience of being always connected! In the email, P1 is recommending these customers to sign up for TM’s Unifi or Streamyx plans at market price. The email, likely sent out in stages to all remaining P1 WiMAX customers. Packet One Networks (P1) founded in 2002, a subsidiary of Green Packet Bhd. In March 2007, P1 was one of four companies awarded the 2.3GHz spectrum licence by the government to deploy 4G WiMAX services throughout Malaysia. After months of trial, the P1 W1MAX service was officially launched on 19 August 2008, more than a decade ago, by the Minister of Energy, Water and Communications back then, YB Dato’ Shaziman Abu Mansor. The launch made P1 the first Telco to commercially offer the WiMAX service in Malaysia (Malaysia Book of Records). Two P1 home broadband plans were made available at launch: P1 W1MAX 1200 (up to 1.2Mbps, as low as RM89/month), P1 W1MAX 2400 (up to 2.4Mbps, as low as RM199/month). The company then introduced its on-the-go broadband service called WIGGY in May 2009. It also launched its own social networking site called Ruumz which sponsored the 15Malaysia short film project. 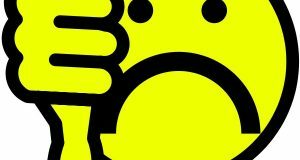 P1 gained wide publicity for its “Sudah Potong?’ or ‘Cut Already?’ ” campaign which appeared on various media including newspaper, TV and radio. It (video below) created buzz from the day it was launched, from October 2009 to December 2009. The campaign appeared to be targeted at Streamyx which is offered by Telekom Malaysia TM, P1’s rival at the time. In March 2014, TM initially invested RM 350 million in P1 and now owns more than 72.9% of Packet One Networks (P1). Packet One Networks (Malaysia) Sdn Bhd (P1) was later re-branded to webe. 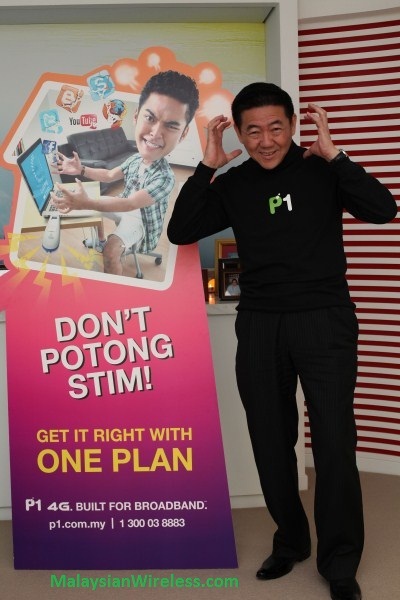 While P1 maintained the existing WiMAX network, webe launched its own mobile 4G LTE service. Prior to the TM investment, P1 also received investment from Intel Capital, investment firm Kendall Court and Leafgreen Capital and South Korea’s SK Telecom. As of September 2012, P1 had 505k subscribers. In April 2016 it was reported that P1’s WiMax service only had about 170,000 subscribers. With the number of subscription even lower now (P1 stopped offering the WiMAX service to new subscribers since the launched of webe), the network is being shut down in phases to make way for webe, now known as Unifi Mobile. The P1 WiMAX service runs on the 2.3Ghz band with a 30Mhz spectrum. 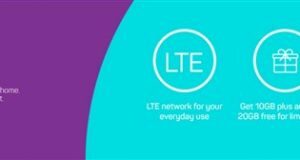 Over the past 1 year, Unifi Mobile (webe) started offering its 4G LTE mobile service using the 2.3Ghz spectrum leaving only about 10Mhz for the P1 WiMAX service. The Unifi Mobile service also runs on the 850Mhz band with about 5Mhz spectrum. By taking down P1’s WiMAX network, Unifi Mobile will have access to the remaining spectrum allowing it to offer better coverage and faster 4G LTE speeds. Unifi Mobile will also be offered using the 2.6Ghz spectrum which TM now owns. TM’s exiting 4G LTE service called TMgo (estimated 60k subscribers) is expected to merge with Unifi Mobile. Some 8% of TM’s 2.35 million customers are also on Unifi Mobile. Technology news portal, Amanz recently reported that Unifi Mobile will offer a new prepaid plan soon with up to 20GB of free LTE Internet data. There will also be add on plans up to RM50 for 8GB of Internet.